Brown mulberry longhorn beetle is not present in Australia but is widespread in the Asian region. It only feeds on living trees (but these may be healthy or stressed) and its potential effect on Australian native plants is not known. The beetle is most likely to arrive in imported timber and wood used for pallets, or other packing materials from Asia. Look out for larval tunnels in the wood up to 15 mm wide, sawdust-like frass falling from damaged timber, and oval-shaped exit holes. Diligence is particularly essential with imported material from India and China where it has been reported as a major pest of mulberry and poplar plantations. In Australia, many woody species within the Moraceae, Salicaceae and Ulmaceae families may be affected, including elm, fig, mulberry, poplar, pear, citrus, rosewood, hawthorn, lagerstroemia, mulberry, walnut, and willow, as well as other tree species. Description: The Brown mulberry longhorn beetle lifecycle is thought to take about 1 year in India, but may take multiple years in cooler climates. Adults emerge in summer. Immatures: Larvae are legless, creamy white in colour that reach about 70 mm long and 13mm wide. Just behind their heads on the dorsal side there are hard, brown marks. Adults: About 26 to 50 mm long with a black body covered with tawny-brown to greenish-yellow hairs (which is predominantly what is seen). There are many dome-shaped nodules just behind their heads (on the elytra). The antennae are brownish black with whitish grey rings and can be up to one third longer than the body. 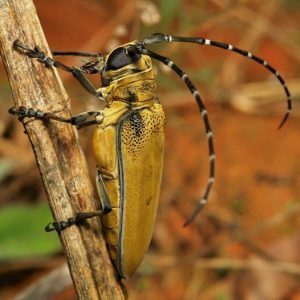 There are numerous longhorn beetles in Australia that look somewhat similar. Damage: The beetle only feeds on living trees, however can be transported in processed timber e.g. pallets or crates made from host trees. After eggs hatch, the developing larvae (often referred to as roundhead borers) feed under the bark forming wood boring tunnels in woody tissue. Larger larvae then bore into heartwood, with small frass expulsion holes made through the bark. Over time, the feeding activity of the larvae cause a decline in the health and longevity of trees; trees are more prone to windbreak. Feeding damage reduces the quality and quantity of timber and may facilitate entry of pathogens that discolour wood or cause tree decline. If you suspect that you have detected this species contact your local biosecurity agency or the emergency plant pest hotline: 1800 084 881. Note that the Pest ID tool is now available with free access to industry.